Strawberries are their sweetest when fully ripened on the plants. For most varieties, this means leaving the berries on the plant for a day or two after they are fully colored. The only way to know for sure is a taste test. Most varieties will be ready to start picking within four to six weeks after they bloom, so keep an eye on them. Your strawberries will ripen over the course of a week or two. Check daily and harvest all that are ripe, but don't rush them. Strawberries with green tips are not ready to pick, no matter how red the stem end is. You've waited this long, let them hit peak flavor. On the other hand, don't leave them to become overly ripe. They will get soft and possibly rot if the birds and other wildlife don't get to them first. 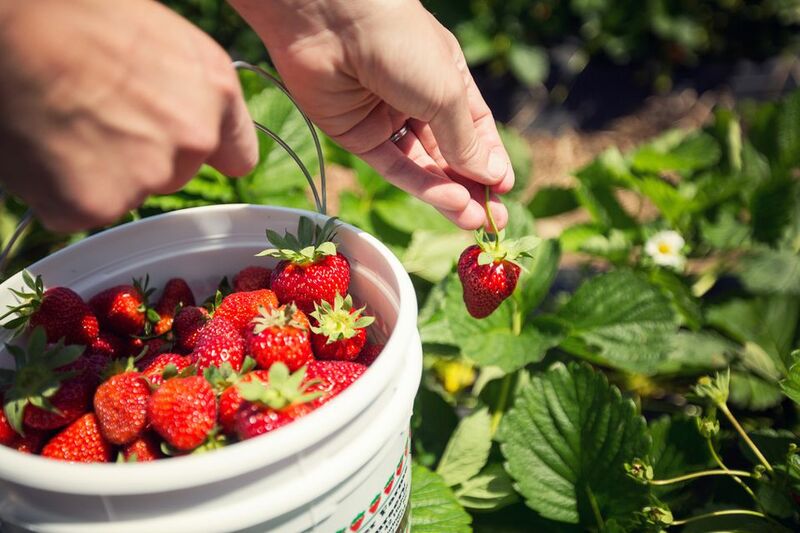 Fending off hungry animals is probably the hardest part of harvesting strawberries. Unfortunately, animals are not as finicky about ripeness as we are. They will start nibbling days before we're ready to harvest, so be prepared. You might want to consider tossing a lightweight row cover over the berries when they are getting close to harvest time. Fruit cages work great for this, especially the ones that are large enough to walk into. However they can be costly and also impractical in small gardens, so you'll have to improvise and cover the fruits as best as you can with either row covers or a bent section of wire fencing. You still want to be able to get into the rows to pick the berries, so you don't want anything that will be cumbersome to lift. Strawberries bruise easily. Be gentle when pulling them from the plants. You don't want the stem to be completely pulled from the berry, leaving an open wound for disease to sneak in. Snap the stem directly above the berry rather than pulling on the berry itself. This will also keep the berry from oozing its juices and keep it plump and fresh longer. This type of picking can be a little tricky to learn, but after a few rows, you'll be a pro. If possible, harvest at a cool time of day. Warm berries are much softer and more easily bruised than cool berries. Keep the harvested berries in a cool, shady location. Unfortunately, strawberries have a very short shelf life. You really should use them within a couple of days of harvest. They can still bruise after they are harvested and should be handled gently. Try and find a cool spot, with no direct sunlight, to store them. Although refrigeration can diminish their flavor, leaving them on the counter when it's hot can be even worse. It's also best not to rinse them off until you are ready to use them. If you have too many to use, you can freeze berries for use later.